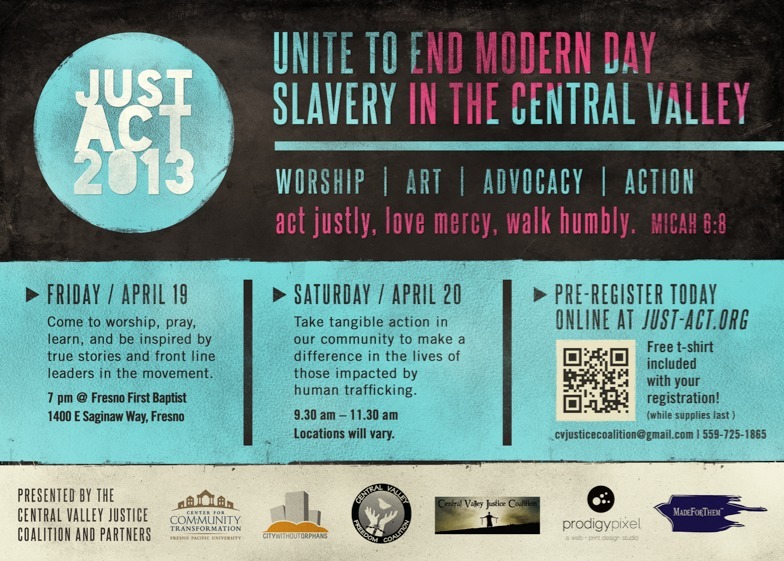 Central Valley Justice Coalition will be part of a session on human trafficking at the 2013 Engage Missional Life Conference on Friday and Saturday October 18-19 in Fresno. The Engage Missional Life Conference focus is equip believers to be “totally committed to living the love of God in all circumstances where people meet Jesus through our grace, compassion, forgiveness, caring, & loving Lifestyle.” In includes workshops taught by those in organizations here and all over the world with opportunities to connect with mission organizations and like-minded people. We will be co-presenting a workshop at 2:00 p.m. on Saturday, October 19 called “Piercing the Darkness: God’s People Leading the Fight Against Human Trafficking” with Chris Sambaugh, co-founder of the The Grace Network in Sacramento, a gospel-based anti-trafficking network mobilizing communities throughout the Sacramento region to combat human trafficking. 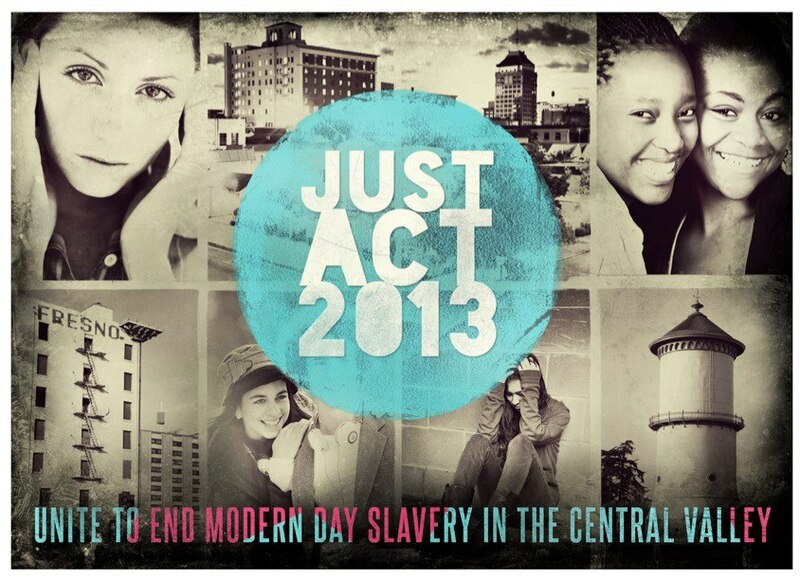 CVJC will be sharing on local human trafficking issues and response. Register to attend the Engage Missional Life Conference here and share this with others you know who are seeking to live a missional life. On Tuesday, May 14, over 30 local pastors and spiritual leaders toured Fresno yesterday and saw first hand the intensity of human trafficking in our city. The group was taken on a bus tour throughout Fresno, stopping at locations where human trafficking happens regularly. Fresno PD shared true stories of both the horrific realities of human trafficking and also the success stories of transformed lives. Back at People’s church, the group heard testimonies from one of our ministry partners, Christine Riley, who shared her story as a human trafficking survivor. Sgt. Curtis Chastain, head of the Fresno Police Department Human Trafficking Vice Unit, Jessica Pittman of Central Valley Justice Coalition, and Andrea Shabaglian of Made For Them were also among many who cast vision at this event. This event was presented by Made for Them and Fresno Police Department, and we hope to have information soon about the next tour. Sign up for our e-newsletter so you will be notified about upcoming opportunities! Thank you for participating in Just Act! The Coalition thanks to ALL who joined us April 19 & 20th for Just Act! A special thanks goes to the 50+ people who spent late hours on Friday night or early Saturday morning ACTING in our community! By supporting this event you all helped us to bring about holistic and lasting change to those impacted by human trafficking. Petitions were signed, demonstrations were held, training occurred, and fervent prayer took place. Friday night there were 25 people who walked and prayed on Parkway Drive – these people took a courageous stand to demonstrate our intolerance of the injustice of human trafficking. If you are not on our e-newsletter list, fill our our form so we can contact you about upcoming opportunities. There will be more Just Acts happening soon! The Coalition desires to continue growing and increasing in impact. To do that, we need money! We ask you shamelessly to give because we believe without a doubt that what we are doing makes a difference. Please click here to learn more about donating.